Temporarily out of stock. Request restock notification. 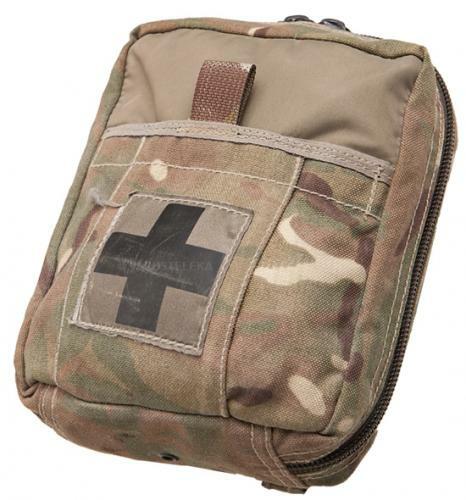 Finally some really decent IFAK pouches hit the surplus market. 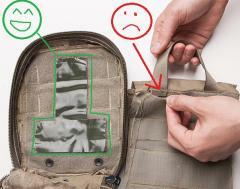 Clever design: open the zippers, grab the handle and *rip* out the medical insert, now you have all your bandages etc. neatly at hand. Also works as an utility pouch and organizer for just about any stuff you want to carry. 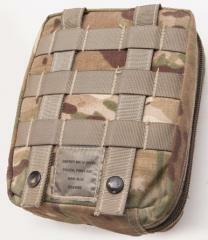 PALS attachment, fits most modern combat vests and backpacks and can also be carried on any belt. Attention! 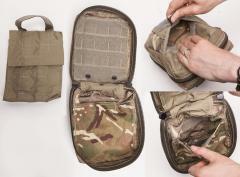 No medical supplies are included with the pouch! The pouch is very easy to organize, it has a bellowed compartment on outside, a flat compartment on the inside, the main "cavity" and a detachable medical instert. 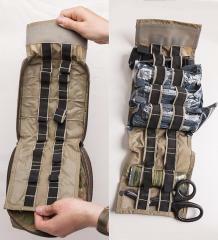 The insert is a roll with elastic bands for attaching medical items, tourniquets, bangades etc. The insert is attached onto the pouch wall with velcro, grabbing the handle and giving it a good tug rips it right off. Dimensions approx. 20 x 16 x 7 cm. The fabric is tough Cordura and zippers are high quality, made by the belgian manufacturer Kroko. A grommet on the bottom lets out any water that may find it's way inside. These are used, faded and sometimes a bit sandy too (wonder why) but overall in nice and perfectly serviceable condition. Tää toimii loistavasti Source kangaroo canteen 1l rakolle kantopussukkana. very good fist aid pouch, does as it said on the tin!